Dr Gregory Slabaugh and his team have developed an automated and integrated Non Destructive Testing (NDT) system, drawing on advanced image analysis, for inspecting and maintaining roads, reducing costs and increasing traffic safety. 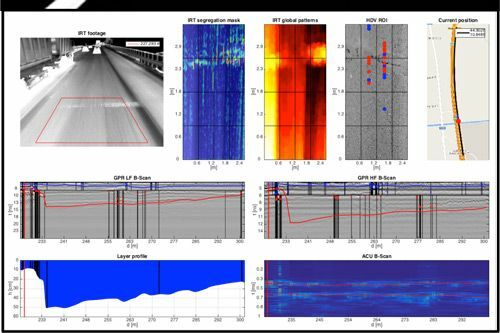 Led by Senior Lecturer and image analysis expert, Dr Greg Slabaugh, City University London researchers in collaboration with nine partners from across Europe, have developed an automated and integrated Non-Destructive Testing (NDT) solution for traffic-speed inspection of road pavement/bridge deck condition. 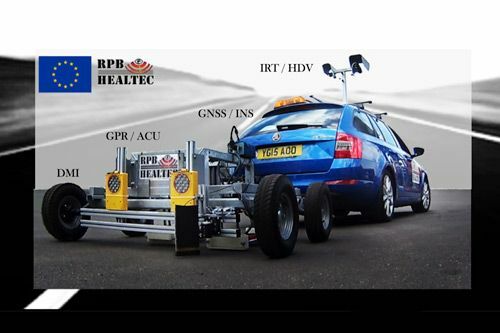 The major aim of the RPB HealTec project, which received €1million from the EU FP7 Programme, is to upgrade and optimize road pavement inspection procedures. This should assist decision-making related to increasing the life expectancy of road infrastructure and help reduce the cost of future construction and maintenance of the European road network. Integration of Ground Penetrating Radar (GPR), Infrared Thermography (IRT) and Air-Coupled Ultrasound (ACU) NDT techniques provides multidimensional information on the road pavement structural condition. The system employs high accuracy spatial mapping with Global Navigation Satellite System (GNSS) / Inertial Navigation System (INS) and high definition video (HDV) along with distance measuring instrument (DMI)-based synchronised data acquisition. Further automated processing and fusion of the sensor data is used for the automatic detection of subsurface and surface defects such as delaminations, cracking and voids, as well as structural and material changes. This analysis provides the basis for further assessment of the extent, severity and causes of deteriorations acting as a decision-support tool in the assessment of the road pavement structural condition. Partner organisations collaborating with City are: I&T Nardoni Institute S.R.L (Italy); MET Geoenvironmental (UK); Global Digital Technologies (Greece); IRIS Thermovision (Netherlands); Autostrada del Brennero SpA Brennerautobahn AG (Italy); Vrancea County Council (Romania); Centre for Research and Technology Hellas (Greece); Centre for Research Technology and Innovation (Cyprus). An inertial navigation system (INS) is a navigation aid that uses a computer, motion sensors (accelerometers) and rotation sensors (gyroscopes) to continuously calculate via dead reckoning the position, orientation, and velocity (direction and speed of movement) of a moving object without the need for external references. It is used on vehicles such as ships, aircraft, submarines, guided missiles, and spacecraft.